Before you drop $150 on Apple's luxurious leather loop, check out these third-party options in exotic leathers and colors. Apple has put a lot of thought into its Apple Watch band options, and it shows. I won’t deny that the Apple Sport Band is one of the most comfortable wrist-adornments I’ve ever worn (ever). But its leather options are limited—not to mention expensive. The Classic Buckle and Leather Loop come in just a handful of colors and cost $150, while the chic Modern Buckle costs $250, nearly as much as the Sport Watch itself. But if you want a leather band, Apple’s not your only option. Plenty of third-party band-makers have stepped in to fill the void. I tried out eight third-party leather bands, including bands made of exotic leathers and a clever button-stud band, over the course of several weeks to see how they break in and hold up. Let’s take a look. Based in Lyon, France, Clessant claims to have the first luxury straps designed for the Apple Watch—designed in France, handmade in Western Europe, and created from exotic leathers such as crocodile, lizard, and stingray. The brand recently finished its Indiegogo campaign, raising 103 percent of its initial goal, and ships its bands worldwide (shipping to the U.S. is $12). These bands are slim, lightweight, and clearly well-designed. They feature bright, saturated colors (as well as a few nicely aged leather looks) and brushed stainless steel buckles that lie flat against the wrist. 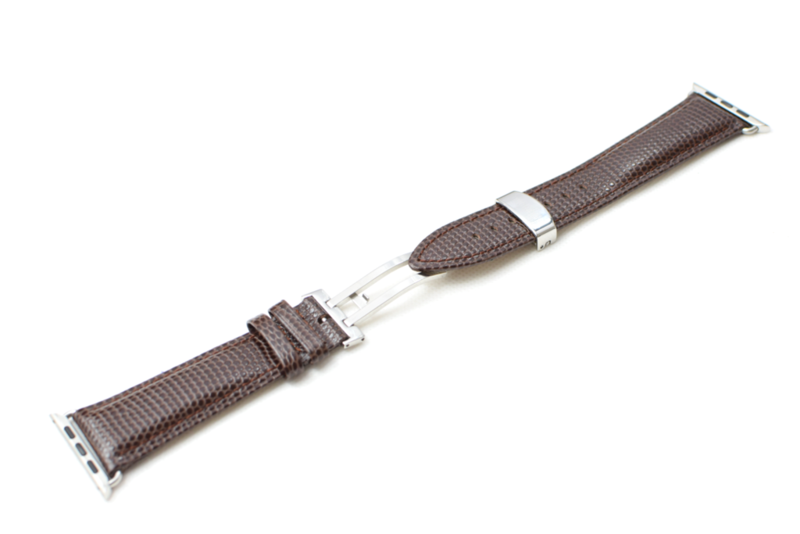 The Clessant calf band comes in three shades of brown. I tested out three of Clessant’s bands: The $111 vintage brown calf leather band, the $236 pastel pink alligator belly leather band, and the $179 mustard yellow lizard leather band. All bands fit me well—the longer part of each band measured 4.5 inches and had 7 holes for adjustment. Because the Clessant bands taper to a sharp point at the end, the adjustment holes did not offer as much size flexibility as other bands I tried: The largest adjustment hole is 3.5 inches from the adapter, whereas the largest hole on the Incipio Premium Leather band is 4 inches from the adapter. Still, there’s plenty of room to punch an extra hole or two if you need to size up or down. Clessant’s calf leather band comes in six colors, which are simply labeled CK1 through CK6. CK1 through CK3 are varying shades of brown (grayish brown, vintage brown, and flat brown), while CK4 is midnight blue, CK5 is black, and CK6 is orange. CK1 through CK3 are vegetable tanned, which will give them a “strong patina and personality with age,” while CK4 through CK6 are chrome tanned with a smooth matte finish. I tested a CK2 (vintage brown) band, which looks amazing: It has a mottled, aged coloring that looks good on men and women. The band was a little stiff at first, but it only took about one day of wear to break in. Despite the relative thinness of the leather, the band didn’t warp much after a straight week of wear, though it warped enough that you can tell it’s no longer new. I love the pink alligator Clessant band. The crocodile/alligator belly leather band comes in six colors: CR1 is pitch black crocodile leather, CR2 is tobacco brown crocodile leather, CR3 is pale blue alligator belly leather, CR4 is pale pink alligator belly leather, CR5 is forest green crocodile leather, and CR6 is royal blue crocodile leather. All of these straps have a textured, matte finish except for CR5, which has a glossy finish. 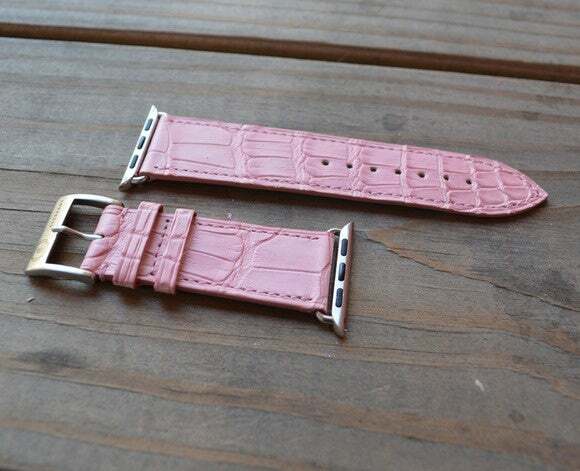 The main difference between Clessant’s crocodile/alligator belly leather and its alligator leather bands, aside from the price, seems to be the size of the scales – the crocodile/alligator leather bands have smaller scales, which are more suited to unisex styles. I tested a CR4 (pale pink alligator belly leather) band, which is one of my favorite third-party bands to date. Not only does this band look expensive and exotic, it’s slim while still being tough—after one week of constant wear, I saw virtually no warping. Clessant's mustard yellow lizard band warped after a few days, but you can't tell when it's strapped to my wrist. 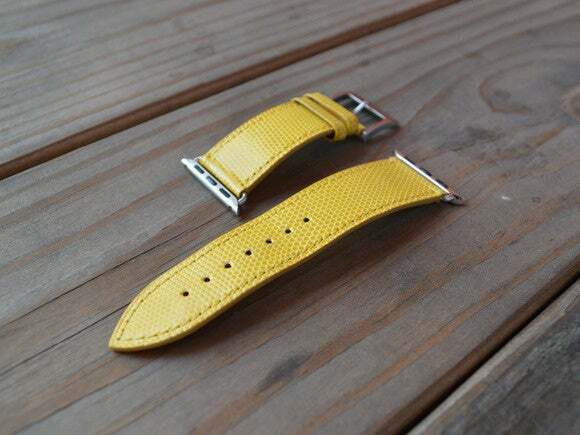 Clessant’s lizard leather bands are for people who like exotic leather and bright colors. Lizard leather comes in five colors, including tan (LK1), fuchsia (LK2), royal blue (LK3), brick red-orange (LK4), and mustard yellow (LK5). All colors feature a textured, glossy finish. I tested an LK5 (mustard yellow) band, which is eye-catching (to say the least) thanks to its vibrant color. The lizard leather is slightly thicker than the calf and alligator belly leather, and so this band took about four days to fully break in and stop feeling stiff against my wrist. It’s also more prone to warping. After a week of wear, warping was noticeable, though not while I was wearing it. Clessant’s bands aren’t cheap—they start at $111 for the calf leather band and go up to $448 for alligator leather—but they do look the part. 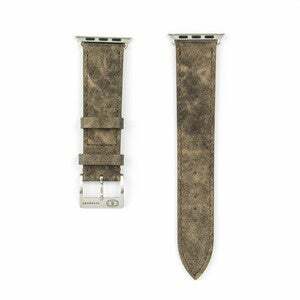 These bands come with your choice of adapter color (polished stainless steel or black) and can be made to fit either the 38mm or the 42mm Watch. While you can definitely find cheaper leather bands for your Watch, Clessant delivers when it comes to precision and quality. If you’re looking for an unconventionally stylish band, you need to check out the Button-Stud Apple Watch band by Orlando-based form•function•form. 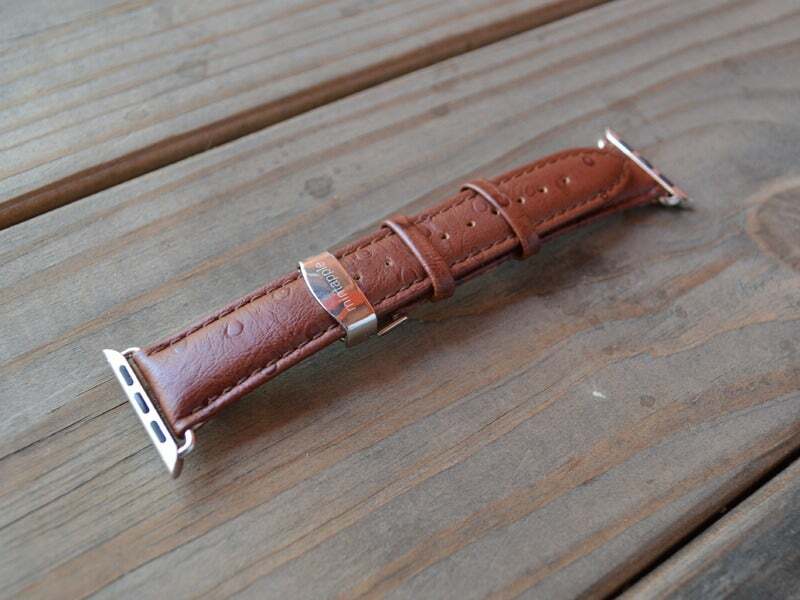 This $94 band is custom-made with latigo leather, comes in three colorsR: io Tan (chestnut brown), Weathered Grey, and Sienna Tan (dark brown). Every band features hand-stitched details and your choice of hardware color: polished silver, matte silver, polished black, or matte black. The Button-Stud band doesn't adjust, but if you need a different size later, the company will exchange it for free. Unlike other bands, the Button-Stud Apple Watch band is not adjustable. This means you’ll need to pick your size, which is based on your Apple Watch Sport Band size, when you order. On the Apple Watch Sport Band, I’m between the third and fourth hole (the third hole is slightly too tight, but the fourth hole is slightly too loose), so form•function•form sent me three bands, one sized for the third hole, one sized for in between the third and the fourth hole, and one sized for the fourth hole. The band sized for in between the third and fourth hole (S/M 3.5) fit me perfectly, though the band should be a little tight initially because the leather will loosen up with wear. The Button-Stud Apple Watch band comes with a lifetime size warranty: If the size you order doesn’t fit, form•function•form will send you a new size as well as a shipping label to return the old band. I needed help putting this one on the first few times. The band isn’t the only thing that’s tight at first—the button stud closure is almost impossible to close the first few times. I had to have another person close the band around my wrist the first three or four times I wore it, but after a few days of taking it on and off it started to loosen up. Thanks to its unique closure, the Button Stud band is comfortable against my wrist. The Button-Stud Apple Watch band is one of my favorite third-party bands so far. It’s comfortable once you break it in. I usually hate wearing things on my wrists while I’m typing, but because the Button-Stud has no clasp, I hardly even notice it. It’s also gorgeous. The design is simple yet unique, and will look good on both men and women. Incipio’s Premium Leather band is made of incredibly soft, pliable leather, and is therefore very comfortable right out of the box. This $60 band comes in black, brown, and chestnut brown, and sports stainless steel connecting hardware and a stainless steel Incipio-branded buckle. Incipio's band is inexpensive at $60 but still looks good. The Premium Leather band is lightweight and simple, with a slightly tapered design that flattens at the end and a single loop to hold the end of the band in place. The stainless steel buckle is curved so it lies flat against your wrist, and it’s pretty comfortable even if you’re picky, like I am, about wrist adornments. 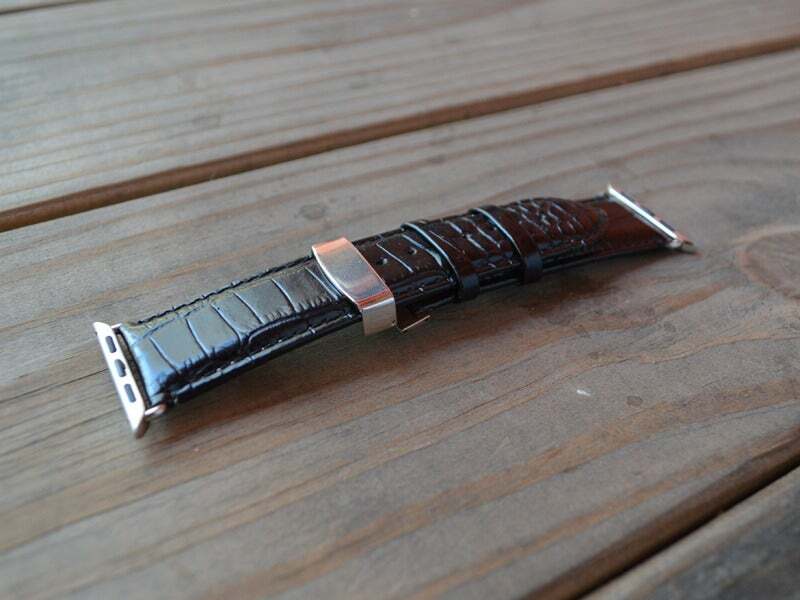 The longer part of the band is about 4.5 inches long (the shorter part is 2.5 inches, not including the buckle) and has 11 holes for adjustment. I have a fairly small wrist, and the fourth smallest hole fit me perfectly. Incipio's band has plenty of holes for a highly adjustable fit. 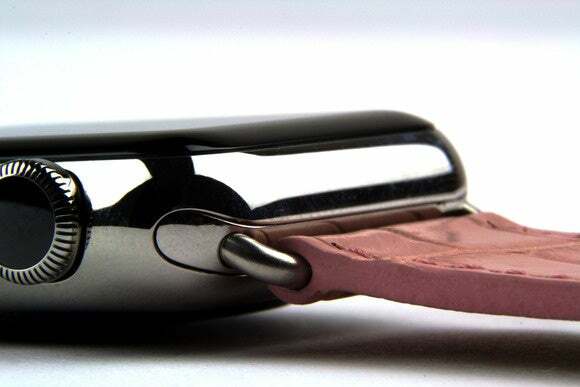 On Incipio’s website, the Premium Leather band appears to come with only one connector hardware option, polished silver stainless steel. While this looks fine against my silver aluminum Apple Watch Sport, it might look a bit more jarring when it’s connected to a space gray or yellow gold Apple Watch. 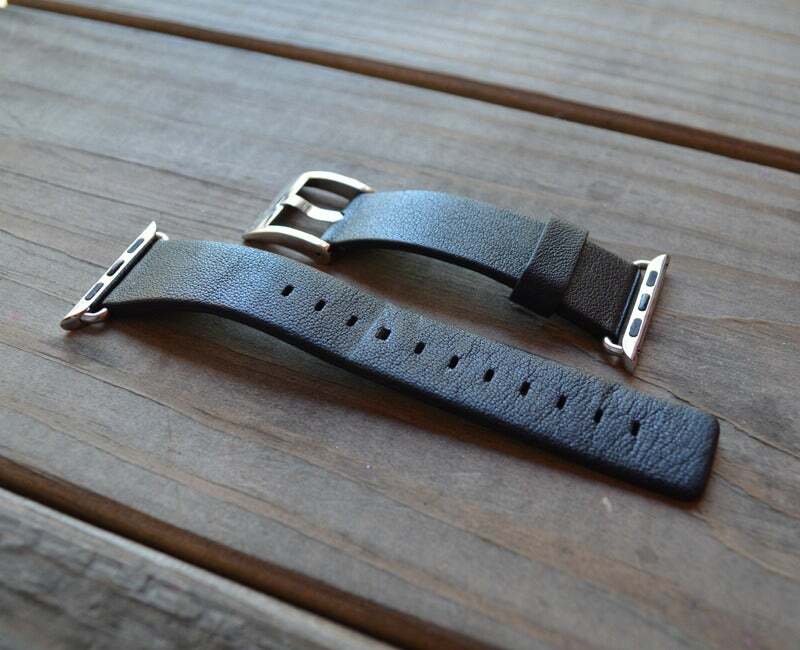 The Premium Leather band is available for both the 38mm and 42mm Watch faces. Incipio's soft leather and curved clasp make this band very comfortable. Incipio’s Premium Leather band is the most comfortable band I tested, and it needs no break-in time. 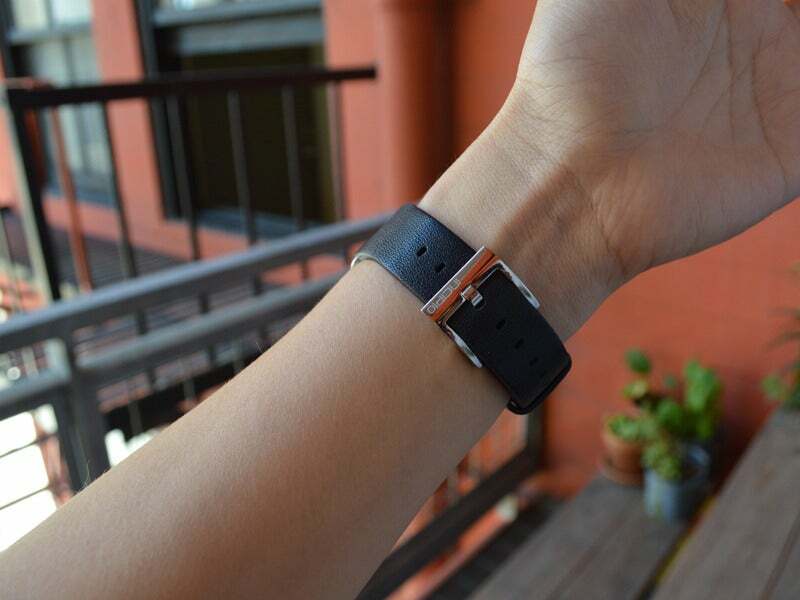 My only small issue with this band, aside from the lack of hardware options, is that the leather might be too soft. After one week’s worth of wear, I did notice a few scuffs and scratches. But for just $60, it’s a sharp-looking strap. Clessant isn’t the only company making exotic leather bands. U.K.-based MintApple also offers Apple Watch bands in crocodile, alligator, lizard, and ostrich leather. MintApple’s bands feature thick, padded leather in mostly neutral colors, and they fasten together with a stainless steel folding clasp instead of a buckle. 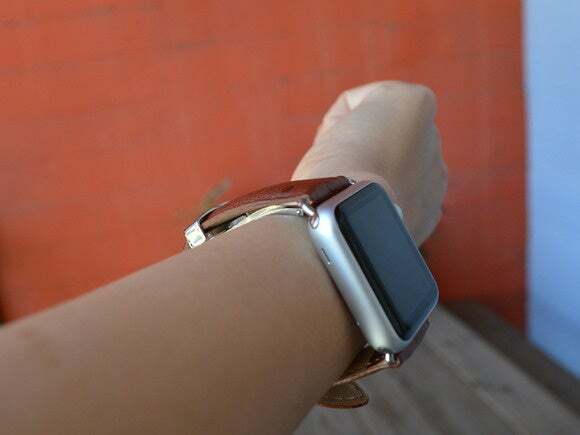 MintApple's band close with a folding clasp instead of a buckle. I tested three of MintApple’s leather bands: The $106 black crocodile leather band, the $106 brown lizard leather band, and the $106 brown ostrich leather band. 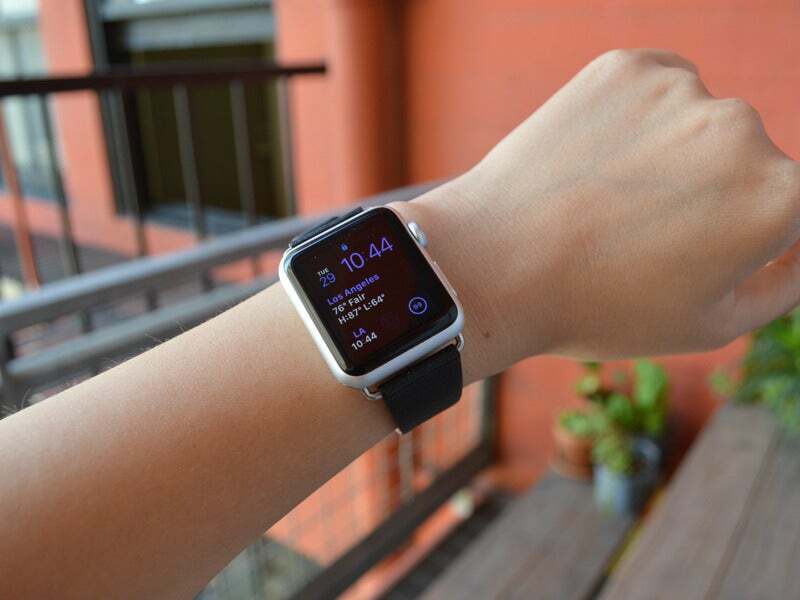 If you have a larger wrist, MintApple’s bands are designed for you. According to their website, these bands can fit a wrist with a maximum circumference (including the Apple Watch) of 222mm, or 8.7 inches. You can also special order a larger size (no word on how big it is), and a MintApple representative tells me that smaller sizes will eventually be available as well. But sizing was the first issue I encountered with the MintApple bands: I have a very small wrist, and none of these bands fit me on even the smallest hole. I had to punch three extra holes in the ostrich leather band, and it still doesn’t sit snug enough against my wrist for my Apple Watch’s heart rate monitor to work. MintApple’s bands feature a clasp instead of a buckle, and I imagine this is not an issue if you happen to have a larger wrist. However, for my wrist, the clasp was simply too big. By the time I punched extra holes in the bands and adjusted them to fit my 5.5-inch wrist, the clasp poked into the bone in my wrist, uncomfortable at best and painful at worst. The clasp is curved to accommodate the curvature of your wrist, but I expect that it’s designed to lie against the bottom of your wrist, not the side of your wrist like mine did. Luckily, these bands are leather and therefore do break in after a few days of wear. The crocodile leather band comes in black, brown, red, and tan, and features large scales and a semi-glossy finish. This band is thicker than the others (though it can be ordered for both the 38mm and the 42mm Watch), and is therefore probably better suited to a larger wrist. The crocodile band is evenly padded throughout and takes about four days to break in. It has two leather loops (one stationary, one sliding) to secure the end in place and seven holes for adjustment. This band feels particularly durable and doesn’t warp at all. 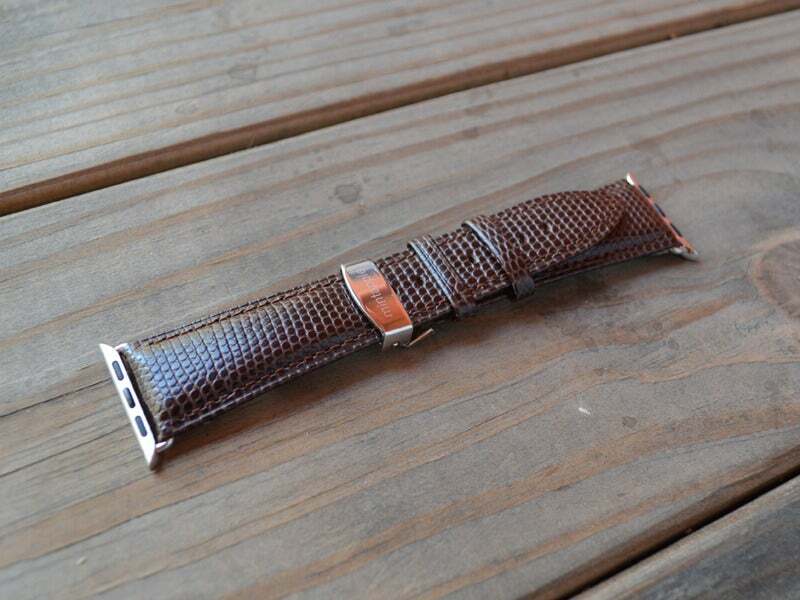 The lizard leather band comes in two colors: Black and dark brown – I tested the brown lizard leather band, which is a rich, deep brown with a textured, semi-glossy finish. This band features thick, padded leather near the adapter, and tapers off into thinner leather near the end. It has seven holes for adjustment (I had to punch an extra three), a MintApple-branded polished silver clasp, and two loops (one stationary, one sliding) to secure the end in place. MintApple’s ostrich leather band comes in black, brown, and red, and has a matte finish. I tested the brown ostrich leather band, which is lighter brown than the brown lizard leather band (more of a caramel color). Like the lizard leather band, this band is padded near the adapter and thinner near the end, but the band itself is also slimmer overall. It’s a much more feminine profile and looks less bulky than the lizard or crocodile bands. The ostrich leather is smooth and flexible, and took less than a day to break in and be comfortable on my wrist. The MintApple bands were a little too big for my wrist. MintApple’s bands are good-looking, if a little bulky—if you can stand the clasp situation. The company also makes a soft leather band that comes with a buckle instead of a clasp. Because these bands are made to order, MintApple offers custom adapter hardware in different colors, including polished stainless steel, space gray, space black, gold, and rose gold, but not matte aluminum (at least, not yet). This is the only company I’ve seen so far that has adapters to match the new gold and rose gold Apple Watch Sport colors.